Osborne’s Mansion House speech last night reverts to the old-fashioned economics of the governor of the bank of England in the 1920-30s, Montague Collet Norman, which led to the General Strike of 1926 and the Wall Street crash of 1929, followed by the desperate misery and hand-to-mouth subsistence of the 1930s which was so etched on the psyche of the nation that Winston Churchill, wartime hero though he was was, was evicted from office because the country was determined never to go down that route again. But that is precisely what Osborne is now offering. The only thing that finally pulled the West out of the biggest depression for a century in the 1930s was the Keynesian revolution that in a deep recession deficit financing made sense whilst obsessive sticking to balanced budgets did not. Yet the latter is what Osborne is now proposing. The blindingly obvious flaw in Osborne’s Micawbernomics is that it takes no account of the fact that capitalism is relentlessly prone to boom and bust. Subjecting the economy to a single overriding instruction irrespective of the underlying capitalist cycle is like Canute commanding the waves to retreat irrespective of the ebb and flow of the oceans. Keynes’ insight was to see that, contrary to the conventional propensity to cut expenditure in a deep recession which further deepened the recession, what was needed was precisely the opposite regimen of using public investment to kickstart the economy to generate sufficient growth to encourage private investors, previously holding back because they could see no prospect of profit in a flat or deteriorating economy, to start investing again. Obama did this, which is why the US growth rate since 2009-10 has been far higher than the UK rate. Merkel was able to pursue her balanced budgeting, though at a cost of sharply diminished growth, because Germany has by far the largest export surplus in the Western world. Britain by contrast has the worst balance of payment deficit in traded goods in its history, now running at £100bn a year and rising, and imposing Osborne’s obsession with balanced budgeting to enforce a surplus every year can only be achieved at the cost of driving growth into the ground – as Merkel’s merciless austerity measures are doing to Greece. Yes, the British economy did, after 2.5 years of stagnation following Osborne’s austerity budget of June 2010, achieve a temporary surge of growth for 18 months between early 2013 and mid-2014, but since then UK growth has plummeted to just 0.3% in the first quarter of this year. 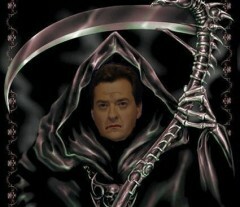 Osborne’s fantasist claim to be ‘fixing the roof while the sun is shining’ is belied by reality. The sun isn’t shining with a current budget deficit of £92bn combined with a growth rate bumping again on the floor. If he persists with his declared goal of eliminating the budget deficit by 2018-9, the intensified austerity involved will very likely drive Britain into a third recession. It is all very scary and I do fear very much for my disabled sons future :0( My only hope (as Labour PLP often seem useless at countering Osbornes arguments) is that this govt will go to far. Get too greedy and confident and people will finally have had enough of it!